When the DSM Console Server is equipped with a dial-up modem, this allows you to communicate with the DSM via either network or dial-up. When unresponsive network elements disrupt communication via network, remote support personnel can then establish an out-of-band connection via dial-up in order to revive malfunctioning devices and restore network communication without the delays, hassles and expense of a service call. In many cases, the most simple solutions are the best. Although the humble dial-up modem has justifiably fallen out of favor in the field of data transmission, communication via analog modem still performs a valuable service in out-of-band network management applications. When a critical network element at a remote equipment site crashes, and takes down network communication, a dial-up modem can provide an effective, economical means to communicate with malfunctioning devices in order to restore communication. A DSM Series Console Server with the Dial-Up Modem option deployed at a far-away site provides tech support personnel at your NOC with quick, secure dial-up access to console port command functions on distant network devices. Once connected, support techs can access console ports on unresponsive devices and then alter configuration parameters or reload routing tables in order to revive crashed network elements without the delays, hassles and expense of a service call. 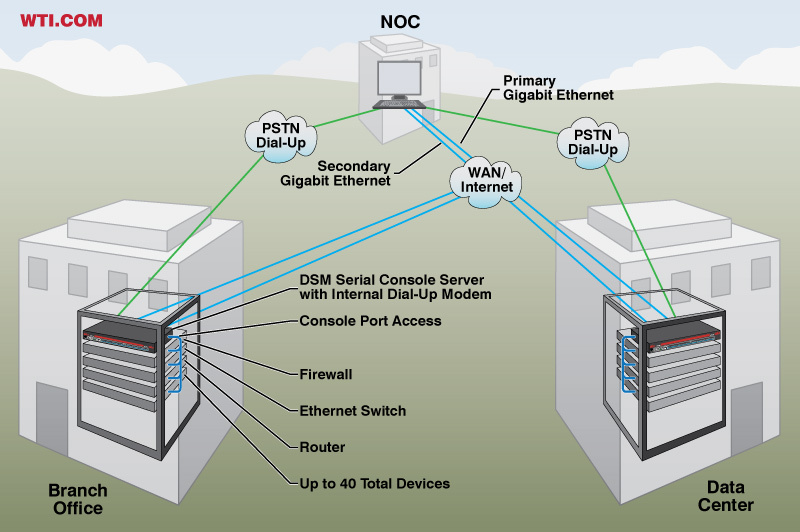 If the DSM Series Console Server includes both the Dual Ethernet Option and the Dial-Up Modem Option as shown in the graphic below, this provides network administrators with three secure avenues for access to console ports at distant equipment sites, creating a reliable, redundant OOB management solution, which proves particularly helpful in mission critical network applications.